The Device Shop has the ability to fix water damaged Samsung Galaxy S4 as well. Between our expert technicians and state-of-the-art Drybox®, there’s a good chance we can get your water damaged Samsung Galaxy S4 back to life. 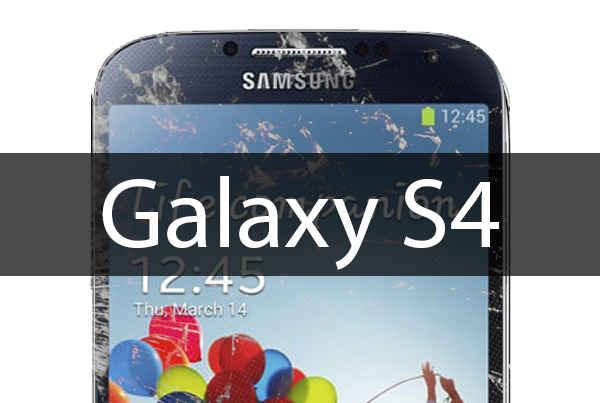 The Samsung Galaxy S4 is the 4th edition of the Samsung Galaxy Series. The Galaxy S4 launched on April 26, 2013 and screens, power buttons, and batteries began breaking soon after. The Samsung Galaxy S4 contains a 2600mAh Lithium Ion Battery. And generally beings to fail after a year and a half of use. The battery on the Galaxy S4 can be changed in less than 15 minutes. The Device Shop also is easily able to replace the dock connector on the Samsung Galaxy S4 in about 30 minutes*. The Dock Connector on the Galaxy S4 is the same component that regulates the charging, menu flex cables, and microphone. If your Galaxy S4 has any issue pertaining to that listed above, this is the repair you’ll need. If your Samsung Galaxy S4 Camera doesn’t open, has spots, or is blurry you may need a new camera. The Device Shop can fix that as well. Bring it in so we can diagnose it, and if we can fix it, we’ll have you in and out in 30 minutes. The Samsung Galaxy S4 Glass Replacement is the most common repair for the S4. If you’re able to continue to use the device without any issues with your touch, or discoloration, this is the repair for you. The cost of the glass replacement is $89.99 + tax and it takes a couple of hours. This repair can be completed at either our Times Square office or Lower East Side. You can make an appointment at your earliest convenience by clicking here. The Samsung Galaxy S4 LCD Replacement is a fairly common repair. If you’re not able to use the device but you can hear it making noises, ringing, menu flexes light up, etc… this is the repair for you. The Samsung Galaxy S4 battery replacement takes about 15 minutes. If your device shuts off randomly, looses charge quickly, and you don’t get at least 5 hours of constant use, a battery replacement may be in store. The current cost of the iPhone 6 Battery replacement is $39.99 + tax. The Samsung Galaxy S4 Dock Connector / Microphone regulates several important components of your S4. First and foremost it regulates the charge. If your Galaxy S4 won’t charge, or charges intermittently, there are several steps to take before you come to The Device Shop. Try different chargers and see if your charging cable is going all the way into your device. It should sit flush against your phone and the charge should be constant. If it’s not sitting flush there may be something blocking it, often times lint. If you have a tweezer you can try to get it out yourself, but be careful not to damage any pins. The Dock connector is also part of your microphone. If you have issues with being heard or static while speaking on the phone you may need to replace this part. The Device Shop charges $49.99 + tax to replace the dock connector / microphone on the Samsung Galaxy S4 and the repair takes less than 45 minutes. The Samsung Galaxy S4 Headphone Jack regulates several important components of your S4. If you are having difficulty hearing out of your headphones, there are several steps to take before you come to The Device Shop. Try a different pair of headphones first to see if your set is the issue. If you have issues with your headphones being plugged in, only hearing out of one ear, something stuck in there – you may need to replace this part. If it’s not sitting flush there may be something blocking it, often times lint or in some cases a piece has broken off your headphone’s connector. If you have a tweezer you can try to get it out yourself, but be careful not to damage the port. The Device Shop charges $49.99 + tax to replace the headphone jack on the Samsung Galaxy S4 and the repair takes less than 45 minutes. Samsung Galaxy S4 Water Damage repair can be tricky to fix. Whatever you do, DO NOT CHARGE YOUR PHONE. Once you retreive your device and realize it’s gotten wet, turn the device off immediately. It’s very important you bring your device to one of your locations as quickly as possible, as time is of the essence. Once you bring the device in, first thing we’ll do and open it up and see if there is any liquid still inside the device. If it is, we’ll stick it in our DryBox® to remove any excess liquid. Once the device is completely dried out, we’ll go through a series of steps to try to power on your Samsung Galaxy S4. It’s also important to note that we do not offer a warranty on Samsung Galaxy S4 water damage repairs. Even if the device turns on and is functioning properly, residual issues can appear. The Device Shop is not responsible for any residual damages. The Samsung Galaxy S4 Back and Front Camera replacement is generally required when the camera shutter doesn’t open, or the app is crashing automatically. You may be able to toggle the front camera, but could freeze on the back camera. The Samsung Galaxy Back Camera is $49.99 + tax to replace and takes about 30 minutes. The Samsung Galaxy Front Camera is $49.99 + tax to replace and takes about 30 minutes. The Samsung Galaxy S4 Power Button replacement is generally required when you are unable to power up the phone. This repair requires soldering and takes about 45 minutes. The repair cost is $49.99 + tax. The Samsung Galaxy S4 Home Button replacement is generally required when you are unable to return home or close out of apps. This repair takes about 45 minutes as well. The repair cost is $49.99 + tax. The Samsung Galaxy S4 SIM Card Reader replacement is an uncommon issue on the S4, but it does happen from time to time. If you are having trouble connecting to your SIM Card, you should check with your service provider first to see if the SIM Card is active. If the SIM Card is not active, they should be able to provide you with a new SIM Card. If you are still having issues with your SIM Card connectivity, you should come visit us at The Device Shop as your SIM Card Reader may need to be soldered or replaced. The repair cost for the Samsung Galaxy S4 is $49.99 + tax.